Influencer marketing is not one-size-fits all. Obviously connects you with the ideal influencers for your brand and your audience. Obviously connects you with an entire network of powerful micro-influencers whose highly engaged audiences insure that your message reaches the right people at the right time. By working with as many influencers as necessary, we can scale your campaign to the size that is right for you and your objectives. In addition, we can work with larger macro and celebrity influencers, who are the faces of your campaign, and can guarantee their audiences are authentic and engaged. Obviously matches you with influencers whose personal aesthetic evokes the look and feel of your brand, so you can keep your messaging consistent while allowing influencers to generate unique and creative content for you. We identify influencers using multiple criteria, such as age, gender, location, interests, and aesthetic to make you are connected with the best influencers for your brand. Additionally, we provide you with detailed analytics of each influencer’s audience - where they live, how old they are, and what they’re interested in. This way, we maximize the opportunity for audiences to engage with your brand. One of the pitfalls of managing influencer campaigns is falling prey to dishonest influencers who are buying fake followers or boosting their engagement artificially. Our technology allows us to easily identify and avoid fraudulent accounts - presenting you with only those influencers with healthy, authentic, followings. 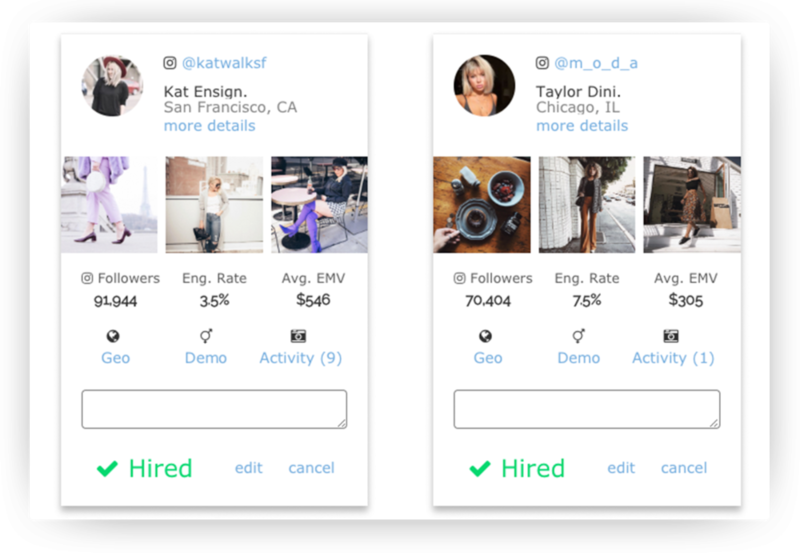 Obviously does the hard work of identifying and contacting qualified influencers, while letting you determine who you love most. We present you with a list of strong candidates, and you can rest easy knowing your favorite influencers are already vetted, qualified, and ready to collaborate with you.